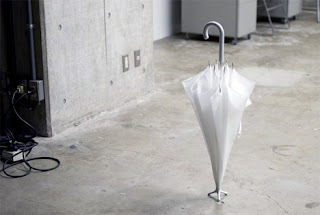 From designer Hironao Tsuboi and through Yanko Design, the Standing Umbrella does just that - it stands upright on its own in order to dry, no can or leaning-wall needed. This is a great concept from a functional perspective: when other umbrellas lean against anything while drying, the area of contact is slower to dry. Worst case, mildew; best case, some drippies on the wall. So, a thumbs-up on that portion of the design. Ahem... I'll keep my cool for now. Seriously though, technological feats like those described in the blurb can be done - let's just make sure to use them for worthy reasons.